Yahoo is making search safer today by automatically flagging potentially dangerous websites in search results. Using McAfee's SiteAdvisor service to rate websites, the new SearchScan feature will place alerts next to problematic results. Three types of risks will be identified: browser exploits, dangerous downloads, and unsolicited email. Websites that are classed as having browser exploits will be removed automatically since just visiting them can damage your computer. But in case you don't want to have Yahoo filtering your search results, you can always change your search preferences to turn SearchScan off. 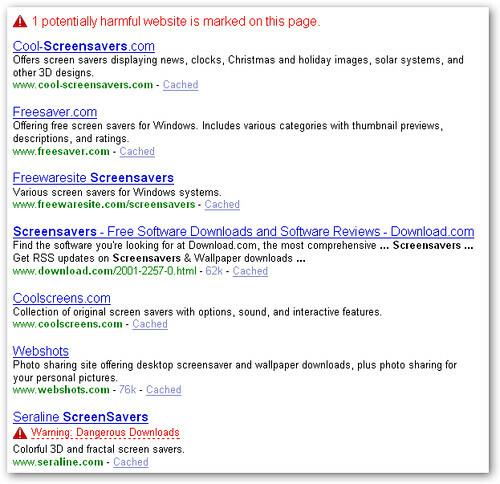 You can also decide to remove all sites that have warnings attached from results. Experienced users probably won't find the new search filtering that useful, but the extra-paranoid or novice browser might find the warnings reassuring. To see the new feature in action, simply type something like "screensavers" into the Yahoo search box. By default, SearchScan is turned on for users in the U.S., Canada, UK, France, Italy, Germany, Australia, New Zealand, and Spain. Yahoo Search Results for "screensavers"